On a quiet evening in the summer of 2002, I took a break from my usual binge of cartoon-watching to join my dad on the couch in front of the television. He was watching Venus and Serena Williams play in their third consecutive major championship final at the U.S. Open. I had never watched tennis before, but couldn’t for the life of me figure out why they kept hitting the balls outside of the lines. “They’re playing really tough. They make it look easy,” my dad said. “I bet I can do it,” I responded in all my 11-year-old naïveté. I had never held a tennis racket in my life. I had no clue what a volley was, the difference between topspin and slice or how to keep score. I also did not understand the rarity of what I was witnessing. In a sport that has a privileged and discriminatory history, I had no awareness of how important it was that two black girls were not only leading, but dominating the sport. All I could think about was getting out there and doing it myself. We hear a lot about the need for role models who look like us. That’s not just a platitude. That’s real. Every year since I was first introduced to the game, I’ve looked forward to September to see Venus and Serena Williams dominate at home court at the U.S. Open. Their example has had a profound impact on me and helped mold me into the man I am today. 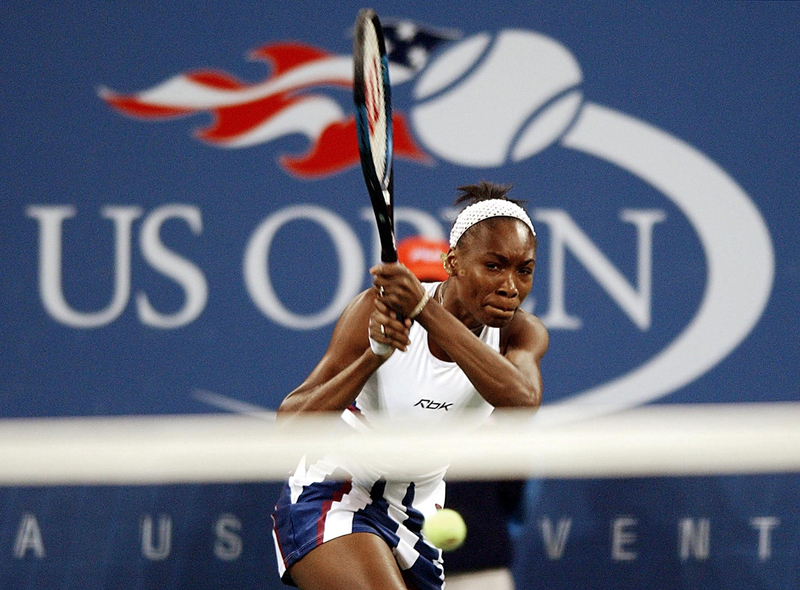 Venus Williams hits a backhand to Serena Williams during their women’s final match at the U.S. Open tennis tournament in September, 2002 at Flushing Meadows, New York. This was the fourth meeting of the Williams sisters in a Grand Slam final. Because of them, I found a sport that I connect with and love. I no longer had to feel embarrassed that I did not enjoy playing football or basketball like many of my friends. Tennis became my thing. It gave me an identity and a confidence that had at times been lost in the expectations of what it meant to be a tall, athletic black boy. My dad, who excelled in baseball and basketball as a child growing up in the 1940s and 1950s, gave me my first few hands-on experiences with tennis. Later, I took lessons and in a few years was good enough to join my high school team as a singles player. I remained undefeated in high school in regular-season play and won the Baltimore City Tennis Championships in 2007. I spent summers teaching tennis to mostly black and Latino children at a summer camp in Baltimore. Few were there for love of the game. Many were there because their parents forced them, because it was affordable or because they could go on field trips and take part in other activities, such as swimming. But those children who showed an interest in becoming better tennis players developed self-confidence, sportsmanship skills and the mental and emotional fortitude for handling high-pressure situations. Black athletes continue to be underrepresented in sports such as tennis, swimming, soccer and lacrosse. Since the four major championships in tennis were fully established in 1925, only two black male tennis players have won a major championship (Arthur Ashe and Yannick Noah). Currently, the highest-ranked black male tennis player from the United States sits outside of the top 50 in the world rankings and Venus and Serena Williams remain the only black top-10 ranked women in the sport. In stark contrast, 67 percent of NFL players are black and 77 percent of NBA players are black. Undoubtedly, there are more black tennis players on the WTA and ATP tours than there were 20 years ago. However, there is still not enough representation. No. 1 seeded Serena Williams returns a forehand to Nathalie Dechy of France at the U.S. Open tennis tournament on Aug. 30. 2002, at Flushing Meadows, New York. This historic summer of the Rio de Janeiro Games brought many firsts for black athletes, some in predominantly white sports. Simone Manuel became the first black woman to win gold in the 100-meter freestyle. Michelle Carter became the first U.S. female athlete to win Olympic gold for shot put. Three black American runners, Brianna Rollins, Nia Ali and Kristi Castlin, led the United States to its first sweep, winning gold, silver and bronze, in the 100-meter hurdles. Throughout the Olympic Games, parents tweeted images of their young children being inspired by these athletes. Former NFL player Prince Miller tweeted pictures of his daughter doing a variety of victory poses like gymnasts Gabrielle Douglas and Simone Biles. Other parents celebrated by showcasing their children as future Olympians. When a child sees someone who looks like them accomplishing great things, it encourages them to believe that they can do those things, too. If I had not seen Venus and Serena Williams play that night many years ago, I may never have picked up a tennis racket and developed my passion for the sport. Once I got started in the game, I followed other black professionals, including James Blake, Alexandra Stevenson and the up-and-coming Donald Young. I looked up to them as examples of what I could become. My game was never good enough to become a professional player, but you would not know that from the belief and confidence I had within myself. Positive reinforcement for black children is important, especially when the accomplishments of black athletes in predominantly white sports, particularly women, are overlooked and forgotten. After Andy Murray beat Juan Martin Del Potro to win his second-straight gold medal at the Rio de Janeiro Games, a reporter congratulated him for being the first tennis player to win two gold medals. Murray reminded him that Venus and Serena Williams won multiple medals before him. They have each won gold medals for singles and three doubles gold medals together. With the U.S. Open beginning this week, millions will be anticipating upsets and tracking their favorite player. I can only hope that another young person will be inspired to pick up a racket and help change the narrative of what it means to be a person of color in a predominantly white sport. Joseph Pate is a lifelong tennis player and fan. He is the digital community manager for the Center for Community Change.